On October 16th, I visited the Bowdoin College Museum of Art. The featured exhibit was a sizable collection of works by Edward Hopper, called Hopper’s Maine. The exhibit featured works that Hopper painted or drew during his numerous visits to Maine between 1914- and 1929. Included in his locations are places like Ogunquit, Monhegan, Rockland, Cape Elizabeth, and Portland. Known for his rich use of color, light and shadow, Hopper’s art conveys a feelings of beauty and profound isolation at the same time. He did a great job of capturing the stark beauty of Maine along with the theme of isolation which frequently recurs in writings and other representations of Maine’s history, that we have studied in this course. Many of the pieces where done while Hopper stayed on Monhegan Island and some were done in various places like Portland Head Light. The entrance to the museum is an ultra-modern, spacious glass cube-shaped structure which offers a choice of stairs or elevator to the downstairs galleries. Admission is free, with a suggested donation box. After reaching the downstairs lobby with gift shop to the left and restrooms to the right, you proceed through double doors to the first gallery. The Hopper exhibit occupied most of the downstairs galleries. Once you reach the end of the downstairs galleries, a long gently-sloping staircase or elevator takes you to the second floor where you are immediately greeted by an impressive wall of Assyrian reliefs. There is a smaller gallery off to the left. The main floor of the museum has a central rotunda with ancient Greek exhibits, two large side exhibit halls and a basement level suite of several exhibit halls. The Bowdoin College Museum of Art, also known as the Walker Art Building, was completed in 1894. It was given to Bowdoin by Harriet and Sophia Walker, collectors and supporters of art education, in memory of their uncle Theophilus Walker, a Boston entrepreneur and businessman. The museum was designed by architect Charles Follen McKim of the firm McKim, Meade and White. The exterior features a wide stone stairway guarded by statues of two large lions, statues of Sophocles and Demosthenes, (Greek philosophers) in niches in the walls, and a beautiful copper dome on the roof. Originally built to house a collection given to Bowdoin by James Bowdoin III and his family in 1811, the museum soon began to expand its collection. Currently there are some 15,000 objects. In 1974, the lower-level galleries were renovated and expanded, and in 2007, a major renovation re-designed the galleries, added the impressive ultra-modern glass cube entrance, a media room showing art-related videos, and modern climate control including special window shades. The museum is a unique asset to Bowdoin College, the town of Brunswick, and the state of Maine. 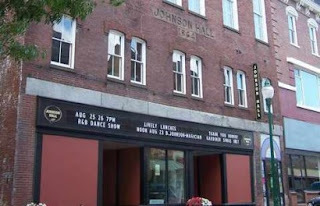 On November 19, I attended a one-man play called “Jimmy Higgins: A Life in the Labor Movement” at Johnson Hall Performing Arts Center in Gardiner. 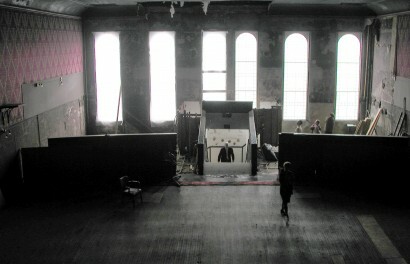 The performance was held in a 100-seat theater on the first floor of Johnson Hall. Johnson Hall is a four-story Italianate style brick building which was built as a theater in1864. It remains the oldest operating theater in Maine. The current performance space was once the livery stable in 1864. The original performance space on the third floor is currently un-renovated and unheated. However, the first-floor performance space has regular arts programming all year round. 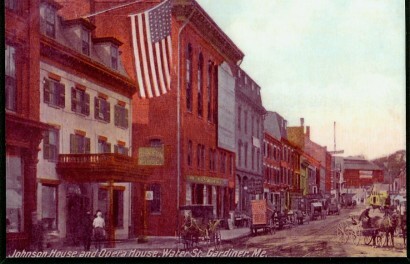 Circa 1864, Gardiner was a vital industrial hub. As the northernmost deepwater port on the Kennebec River, there was a steady flow of ships and commerce from the tall ships through the steamboat area. It was a city bristling with factories, sawmills, manufacturing operations, and of course was a key player in the commercial ice industry. Gardiner native Benjamin K. Johnson, after returning from California in 1858, bought the Cobbossee Hotel and renamed it The Johnson House. In March of 1864 Johnson announced his plan to build a building for large gatherings next to his hotel. In December of 1864 a gala with banquet was held to celebrate the completion of Johnson Hall. The Gardiner Home Journal noted that there were 500 people in attendance and that the turnout was small due to bad weather. According to the newspaper of the time the third floor theater with balcony could seat as many as 1,200 people, making it the largest gathering-hall in the state. Johnson and his wife Henrietta brought in music, vaudeville, plays, choruses, lectures and all the live entertainment of the time. They had the first traveling Broadway show “The Black Crook” (tickets cost 35 cents at the time). The poster (a copy is still on display at Johnson Hall) notes that it had a “carload of scenery” and was “Suitable for Ladies.” In 1888, the theater was renovated, increasing the size of the stage and decorating the hall elegantly. At this time it was called the Johnson Opera House. Benjamin Johnson died in 1902, leaving Johnson Hall to his wife Henrietta. In 1909 the building was leased to Dreamland Theater for showing silent movies in addition to live entertainment. With the introduction of the “talkies” in 1929, Henrietta Johnson approved a major renovation to the theater which added a projection booth, a sloped floor, red leather seats, and stepped-up seating in the back. The second floor housed the concession stand and rest-rooms. It then became a full-time movie venue, which it remained until it closed in 1959. A succession of retails shops occupied the first floor of the building starting in the late 1800s. After the theater closed, the second and third floors became storage for the retail shops on the first floor. The building was saved from urban-renewal-style destruction in the 1980s by a group of people (one of whom was a direct descendant of city namesake Sylvester Gardiner). The groups formed a nonprofit with the purpose of bringing performances and arts education to Gardiner and the central Maine region. They raised $250,000 and renovated the first floor into the current performance space. The long-term vision is to return the building to its former glory, as a 360-seat theater and conference center. On September 8th, our class went on a field trip to the Portland Observatory. The 86-foot high (220 feet above sea level), octagon-shaped red building with light green window trim, tapers to a light green, dome-topped observation deck which commands an awe-inspiring panoramic view of Portland harbor, greater Portland and beyond. Upon entering the building, the first thing that I noticed was the unmistakable aroma of aged pine boards. This olfactory sensation served to help propel us back to the time of the building’s 1807 inception. With the exception of two significant renovations to address structural concerns, moisture and powder post beetle damage, the Observatory is original. On the entry level floor we were shown a trap door which reveals the innovative stone ballast foundation below. After ascending the first set of stairs, our tour guide gave a mini lecture about the history of the building and its uses. The next set of stairs brought us to another floor with additional displays (one of the displays features an early painting of the observatory when it was one of the very few structures in the middle of a large cow pasture). There are four sets of stairs (somewhat uneven) and 4 floors each with interesting facts and displays. On one of the floors was a scale model (based on recent detective work of modern building engineers) showing how the eight massive vertical pine timbers were most likely erected (no original records detailing the tower’s construction have survived). A fifth set of stairs leads to the outside observation deck. Visitors are not allowed access to dome-topped observation enclosure, where the powerful telescope was once mounted. However, a 360-degree deck with railing affords a perfectly unobstructed view. Two interesting design features of the observatory are the octagonal walls and the stone ballast grounding system. By utilizing the octagonal shape the wind resistance, especially of taller structures, is dramatically reduced. Instead of having the wind hit broad sides with greater force, the wind is largely deflected off the smaller octagonal segments. There is no section of wall that is more than 10 feet in width. As someone very familiar with sailing ships, Moody was well aware of the functions of ballast. The structure is anchored to the ground with a massive collection of field stone slabs. The Portland Observatory was the brainchild of Capt. Lemuel Moody (1768-1846). The former sea captain commissioned its construction in 1807. As a man of the sea and entrepreneur, Moody knew the value of having a clear view of the open ocean beyond the islands of Portland Harbor. By erecting the 86-foot observatory on Munjoy Hill, the highest point in Portland, he was able (with the aid of a state-of-the-art telescope) to see and identify ships up to 30 miles out to sea. Through the use of a sophisticated flagging system, he was able to signal local merchants by raising the appropriate flag that would designate the ship that they were awaiting. In these days before steam power, having this kind of advance identification, gave hours and sometimes days of advance warning, depending on the winds. Because of Maine’s vital maritime business this kind of information was invaluable in helping in the planning and coordinating of deliveries and shipments. In addition to his signaling system, Moody provided a local weather report based on his observations. Interested parties would subscribe to his weather publication. The observatory carried on its signaling operations from the time of its construction in 1807 to 1926. During the War of 1812, Civil War, and WWI it was used as an observation post. The Observatory has been owned by the City of Portland since 1936. In 1939, the tower was restored as part of a WPA project. Between 1998 and 2000 a $1.28 million restoration project addressed damage caused by moisture and powder post beetle infestation. The Portland Observatory is an amazingly well-maintained and preserved connection to Maine’s proud and prosperous maritime past. It is a must-see for anyone from away or from just down the street. David Wallace posing with Gorham's Corner plaque. David Wallace next to the John Ford statue. The Informer 1935, The Grapes of Wrath 1940, How Green Was My Valley 1941, the wartime documentaries The Battle of Midway 1942, December 7th 1943, and The Quiet Man 1952. A son of Irish immigrants (John Augustine Feeney and Barbara “Abbey” Curran), John Ford was born John Martin “Jack” Feeney on February 1st 1894. He was one of eleven children. 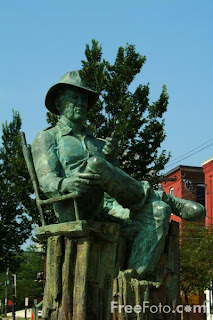 Though the future six time Oscar winning Hollywood Director and Navy Rear Admiral was actually born in Cape Elizabeth, his statue is located in Portland proper. As perhaps Portland's most famous son of Irish immigrants, it's seems fitting that his statue would be located in what was once the heart of the Irish immigrant population. After attending Portland High School Ford moved to California to follow in the footsteps of his older brother Francis who had started a career as a film actor. John landed his first acting role in 1914 in the silent film The Mysterious Rose. In addition to acting, Ford worked as a production assistant and cameraman. By 1917 Ford had made his transition from actor to Director. Between 1917 and 1928, he directed more than 60 silent films. Ford was one of the first directors to incorporate sound into his films. During his 50 year career, he would increase that total to more than 140 films. He had a reputation for shooting only as much footage as he needed and for shooting films in sequence, which meant much less editing. His last completed film was 7 Women 1966. After several years of declining health, John Ford died on August 31, 1973. (Notice the absence of a full third floor). On Sunday October 1st, I went on a tour of the Wadsworth-Longfellow House. The cost of the tour was $12.00 for adults, $10.00 for senior citizens and students, $3.00 for children and free for anyone age 3 or under. Our tour guide was a very knowledgeable man named Howard. While our tour was assembled at the main entrance to the house, Howard presented a brief history of the house as he took us back in time to get a mental image of what Portland would have looked like circa 1786, when it was built. As the name implies, the Wadsworth-Longfellow house was home to both the Wadsworth and the Longfellow families. The handsome three story brick house, (originally two stories) with an attached barn and store, was built by Henry Wadsworth Longfellow’s maternal grandfather General Peleg Wadsworth, a veteran of the American Revolution. After surviving a combat wound and being taken prisoner by British forces, Peleg and his wife Elizabeth chose to build the house in Falmouth (as Portland was formerly known until 1786). Though today it stands as an anachronism in the heart of downtown Portland, the house originally was surrounded by farmland away from the more thickly settled part of Falmouth in the Munjoy Hill area. Peleg Wadsworth chose the current location thinking that its proximity to the busy harbor and the main roads was perfect for conducting business. (He turned out to be right). Construction of the brick house (very unusual at the time) began in 1785 and was completed the following year. In 1786, the house on pastoral farmland would have commanded an unobstructed ocean view, since the shore line was much closer circa 1786 (This proximity to the water was described by our tour guide as “about two blocks away.”) When construction of the house was complete in 1786, Peleg and Elizabeth took up residence with their 6 children. They would go on to have another 4 children while living in the new house. One of their original six children was Zilpah, mother of Henry Wadsworth Longfellow. As we progressed through the house tour, our guide pointed out interesting features of the house, along with related anecdotes. In addition to being made a brick, the house's other atypical design feature was the placement of the chimneys. Instead of being centrally located in the house, the chimneys were placed on the outside ends of the house, so that every bedroom could have a fireplace. After Peleg and Elizabeth moved to Hiram, where Peleg had considerable real estate holding and investments, their daughter would marry Stephen Longfellow and go to on raise their own family in the same house. It was when William and Zilpah were in possession of the house that a full third floor was added. As Stephen began to conduct more of his law practice locally, he set up an office in the parlor. A bookcase with his law books still survives today. It was just off that parlor in a small side room where Henry spent many hours writing in contented solitude. The house was occupied continuously by members of Wadsworth and then Longfellow family from its construction in 1786 until the death of Henry’s sister Anne Longfellow Pierce in 1902. Anne lived in the house for 87 of her 90 years. Anne had been married to a Bowdoin classmate of Henry’s (George Washington Pierce) who died from typhus, leaving Anne a heartbroken young widow. Her loss would be compounded by the death of her sister also from typhus. One of her remaining joys was gardening, and a lovely garden still remains behind the house. During the years that she lived in the house, Anne refused to embrace modern conveniences of the day such as indoor plumbing, although she did have the house refurbished in 1851. We have her to thank for the well-preserved and un-modernized house, with all of its original contents, that stands today. In accordance with Anne's will, the house was left to the Maine Historical Society, in whose capable hands it has rested ever since. As with the Victoria Mansion, the Wadsworth-Longfellow house is one of the very few historic house with so much of its original contents. For anyone interested into taking a trip back in time, I highly recommend a visit. On October 1st, we went to visit the Victoria Mansion on 109 Danforth Street in Portland. Tour tickets are $15.00 for adults, $13.50 for Senior Citizens, $7.00 for college students and $5.00 for ages 17 and under. There is a very well-placed and visible sign which stands on the front lawn to the left of the mansion. Our tour guide was a very outgoing, informative and personable young man named Adam. As awe-inspiring as the historic Italianate-style brick and brownstone house is from the outside, the interior made the exterior pale by comparison. I was immediately struck by the incredible degree of detailed ornamentation and décor of the rooms. Our tour began in the guest parlor, which in keeping with the tradition of the day, was the most exquisitely furnished room in the house. Before the days of the telephone and the internet, people would present their card and wait to be received by the homeowners. The parlor was specifically designed to impress visitors while they waited. Ostentation was not frowned on, but highly desirable. An ornately carved marble fireplace has a gilded framed mirror above, the intricate design of the carpet is duplicated in the ceiling design, the faces carved in the chairs were echoed again above the windows. On the first floor, the dining room is decorated with many kinds of wood, some made to look like marble and other stones. Outside the dining room is a marble sink where guests could wash their hands before supper. The large living room is elegant, and all the furniture, wall hangings and art are part of a flowing composition. Throughout the house there is tromp l’oeil painting on the walls, done by an Italian immigrant artist. The main hall, with its soaring ceiling, is dominated by the wide “floating” staircase with a beautiful banister that curves off to the left and right along the upper part of the hall. At the roof level there are decorated windows in an atrium effect. As you walk up the stairs, ahead of you is an intricate and beautiful stained-glass window. Along the upper hall are bedrooms. One has a built-in four-foot-deep bathtub, also very unusual at the time. Perhaps the most striking feature is the ornate Turkish smoking room, where the gentlemen would smoke after dinner. The elaborate chandelier could be lowered so they could see to play cards. Ladies were not allowed to see the men smoking, so pocket doors closed off the room. At a time when indoor plumbing was still a rarity, the house had a 1000-gallon cistern on the 3rd floor. Gravity fed the water down into the bathrooms and kitchen. The Victoria Mansion—David Wallace, rt. The Victoria Mansion, also known as the Morse-Libby House (named after the two families who resided in it until the early part of the 20th century) was built between 1858 and 1860 as a summer home for Ruggles Sylvester Morse and his wife Olive. Originally from Maine, Mr. Morse made his fortune as a hotel proprietor in New Orleans. He and his wife wanted to have a beautiful showcase home in which to spend their summers, and he wanted features found in his hotels to appear in his house. Morse hired architect Henry Austin to build this Italian villa-style house and interior designer/furniture-maker Gustav Herter to design and furnish the interior. That was highly unusual at the time. During the Civil War, although the house was finished, the Morses could not live there because of his Southern sympathies. But they did live there in summers from 1865 to 1893, and Morse even conducted some business in an office/library at the back of the house. After Ruggles S. Morse passed away in 1893, his widow Olive made a detailed inventory of the mansion’s contents. In 1894 the house and all of its contents were sold to Portland merchant Joseph Ralph Libby. Members of the Libby family continued living in the house until 1928, and during that time, they sold many of the items or gave them away to other family members. After 1928, the house was largely empty and abandoned. During one of the winters, snow broke the atrium windows in the roof of the hall, allowing water to leak in over the years. After narrowly escaping demolition to make way for a gas station in 1940, the house was saved and it has operated as a museum ever since. As with all historic buildings, the process of restoration is ongoing. Fortunately, about 90% of the original furniture was returned by Libby family members or found through research and purchase, so the house looks almost exactly as it would have in its heyday. It is one of the few historic homes in America which is furnished almost entirely with original pieces. On a perfectly sunny and beautiful September 11th, 2011, we visited Battery Steele on Peaks Island. It's a good 20 minute walk from the Ferry terminal. We took a scenic route starting from the 5th Maine Regimental Museum. 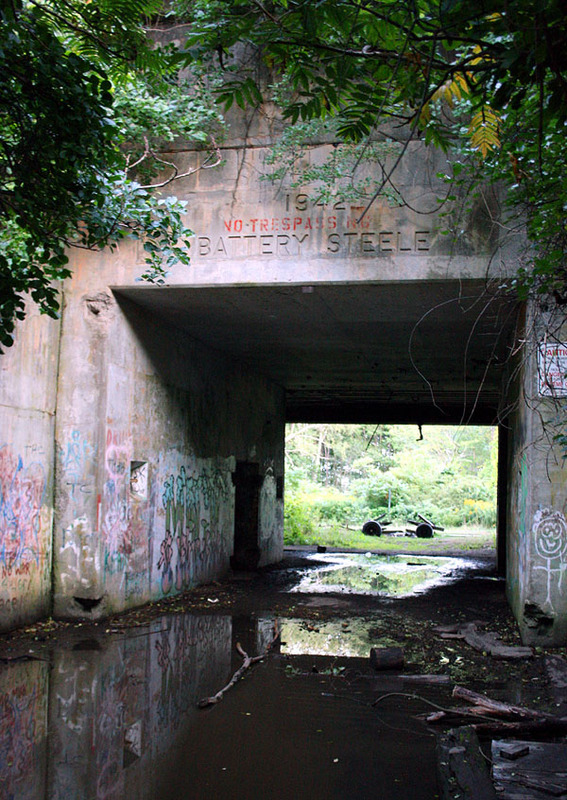 Battery Steele can be easily accessed via the Peaks Island landfill. Though it was a nice walk, it would be no problem to drive right up to the battery's entrance. Other than a small metal sign on a pole in front front of the entrance, there wad no evident additional information. A plague about the battery's history and function would definitely be in order. Admission is free and the tour is self-guided. As a person who has visited numerous abandoned fortifications with generally restricted interior access, I found Battery Steele to be extremely accessible and explorable. 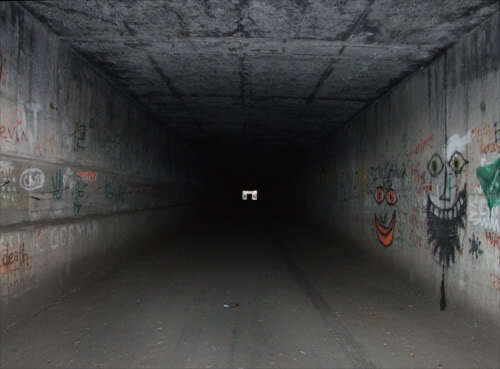 Speaking of interior access, I would highly recommend a flashlight for exploring the voluminous and very dark inner recesses of the battery. (The beginning of the main corridor is the dark area on the left hand wall). During WWII, Battery Steele was part of the Peaks Island Military Reservation which occupied 198 acres (more than 25% of Peaks Island). Battery Steele is an impressive concrete complex which measures more than 500ft long and perhaps 200ft wide. Two 16-inch guns capable of firing high explosive shells weighing 2,240lbs up to 30 miles, were assisted by a very early computer which was supposed to help triangulate the position of enemy targets. (In one of the upstairs rooms of the 5th Maine Regimental Museum dedicated to WWII, there is an interesting newsreel which showed the 16-inch guns being test fired in a wartime exercise and a surviving panel from one of the computers). Though gun emplacements like Battery Steele were built to provide a defense against attack by German battleships, submarines (U-Boats) were the only known enemy naval presence in the waters off Maine’s coast during WWII. The massive gun emplacements of Battery Steele are situated at each end of a extensive connecting concrete bunker complex which would have housed the command, communications and fire control center. View of the main corridor which runs between the gun emplacements at each end of the battery (For perspective on how massive this space is, consider that the tiny white spot in the center of the picture is the opposite end of the corridor). Though the guns themselves are gone, it isn’t hard to imagine how impressive they must have been. If we think about how incredibly loud rifles and shotguns are when fired and they have a barrel opening which is less than an 1 inch, it must have been a positively thunderous explosion whenever the battery fired their guns with a 16- inch barrel opening. For me, Battery Steele is very sobering 3-D testament to the enormity of the U.S. war effort during WWII and Maine's significant contribution to national defense. 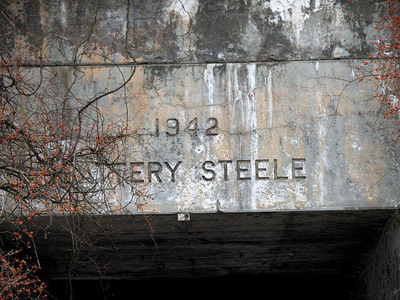 For anyone interested in keeping vital parts of our state's history alive, it should be reassuring to know that on October 20th, 2005 Battery Steele was put on the National Register. On Sunday September 11, 2011, I took a trip with my wife and stepson to Peaks Island to visit the 5th Maine Regimental Museum and Battery Steele. After a pleasant 15 minute ferry ride from the Portland Ferry Terminal we arrived on Peaks Island. The museum is about ten minute walk from the ferry terminal. You start by simply taking a right on Island Road at the first intersection at the top of the ferry ramp and continue along as the road bends gradually to the left. The museum is architecturally designed in the Queen Ann style structure with a wrap-around porch. From the back, it commands a beautiful view of the island’s rocky shore and the ocean beyond. The 5th Maine Regimental Museum 45 Seashore Avenue, Peaks Island was built in 1888 largely by veterans who served in Maine’s 5th Regiment during the Civil War. It was built as both a structure to honor the fallen of the 5th Maine and as a place for surviving veterans and their families to have reunions and spend summer vacations. The 5th Maine consisted of between 1,000 and 1,500 men. Three of the ten companies were soldiers from Portland (circa 1860s a company was composed of roughly 100 soldiers). At its peak use by Civil War veterans and their families, the building had 15 sleeping rooms for families on the second floor and several kitchenettes on the ground level. The building's architecture is in the Queen Anne-style with a wrap-around porch. roof. There is an entry room with a staircase to the left, assorted literature about the building and a basket for a suggested $5 admission fee. Then you proceed into a magnificent great hall. The most attention- grabbing features for me were the many stained glass window panes in red,orange, yellow, and blue, each engraved in the middle with the last name of one of the soldiers who served in the 5th Maine. We were there on a very sunny day and the effect of the sun coming through the colored glass was quite beautiful; giving the great hall a magical feel. There are many interesting civil war relics displayed in glass cases along the outer walls of the room. There are assorted musket/Minnie balls, a piece of the stockade fence from Andersonville Prison, various cannon balls and explosive shell fragments, some swords and at least one rifled musket. In a room off to the side is a regimental flag which was carried by the regiment during the war. On the second floor of the building there is a room to the right at the top of the stairs which is furnished in the style of the 1880s when people would have visited there. Also there are rooms with historical memorabilia and photos, including a room devoted to WWII, and a small library..
Another aspect of the 5th Maine which I found appealing was the authentic feel of the place. Our tour guide was a volunteer who was passionate about the museum and Civil War history. I also really appreciate museums like 5th Maine in which you can get closer to objects and artifacts. I found the 5th Maine Regimental Museum to be a charming, informative and very interesting piece of Maine and U.S. history.